So, here we are now in the final hour of 2011, and what a successful year it has been for the blog. Viewing numbers for this blog have again risen hugely during 2011 with on average 137 people a day viewing PTOTPA. Truly remarkable. There's a phrase kicking round at the moment, "Blogging; Never before have so many people with so little to say, said so much to so few". But that's simply not what its about, its about giving people 'hopefully' interesting things to read, about what they're interested in, in a space where people can understand what the writter is on about, and people can interact. I don't do this to attract huge numbers, but even so, I never thought the blog could or would be as popular as it is today. For this, I must once again bow down to Graham Richardson who through his efforts brings in many extra people who otherwise may have never even discovered my corner of the internet. 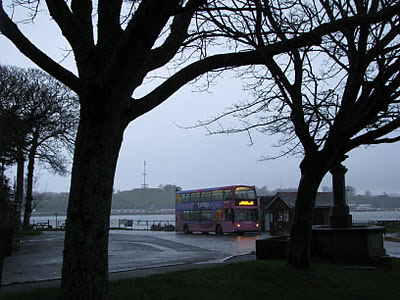 Plymothian Transit brings in approximately 730 people a month to PTOTPA, around a quarter of all my views, and has passed on many of his regulars to here in months and years gone by, so as afore mentioned, thanks once again to him. Towards the end of the year I introduced the PTOTPA 'Live' concept where I would update a Facebook site for general news, new photos, new posts, and anything else of interest. This has had a good response so far, so thanks for your support, I hope its been of use to you. The Twitter account has been used to both live updates as I'm out and about, as well as a documentation on my activities on various forms of transport. This currently has 19 'followers' to it. Just to remind you, you can view my posts on the Twitter account without having to 'Sign up' to twitter yourself. 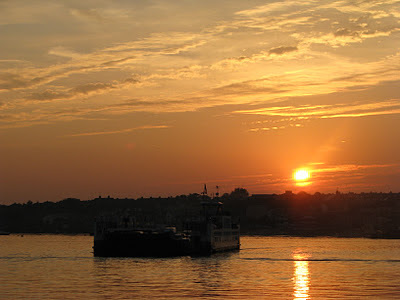 I have included a readout of my latest posts to this account on the right hand side of the blog page, as well as a link to both the Facebook and the Twitter account. I appreciate these mediums aren't to everyone's liking though! So, the future of PTOTPA. Time for some serious talk. It is highly likely I will be leaving the region during 2012 to take up a place at one of the UK's fine universities, providing that my effort pays off this year at A-Level, and I get the required grades to enter the courses I choose. 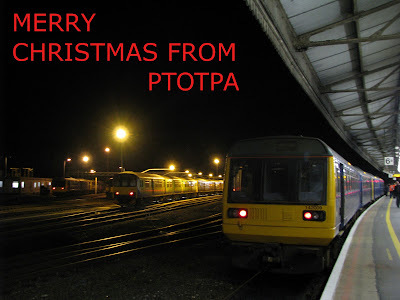 This will of course mean I won't be in Plymouth to be able to update you on news in the area, so during this year the fate of PTOTPA will need to be decided. I've been thinking over several options, and of course there at the moment is plenty of time to sort it out, but I shall introduce some of my thoughts to you now. 5. I close PTOTPA, end of. Please do feed free to make your thoughts known on this. I would hope that I will be able to start a similar blog focusing on whichever city I end up in come September, but undoubtably many of you won't be interested in constant news feeds from the likes of Birmingham and Huddersfield etc. The Mercedes 709 continues to dwindle away as we end 2011. 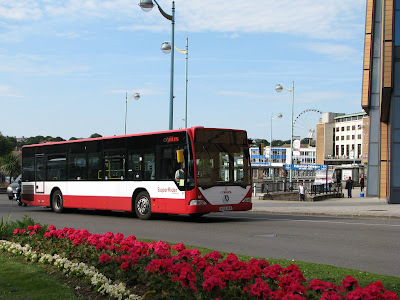 Of course Plymouth Citybus' were withdrawn many months ago now, but Target Travel have run a select few of them throughout 2011. 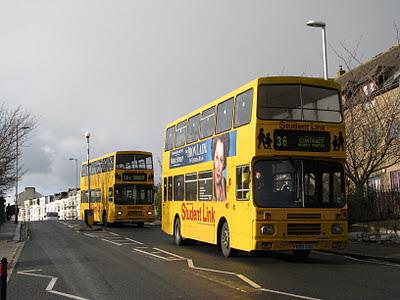 The hallmark N-BNF reg duo from Huddersfield though have now been retired, and N94 can be viewed for sale on e-bay as can be seen on the link below. Very reasonable price at the time of writing, although the reserve hasn't yet been met. The 709s are such lovely solid little vehicles, the Vario never really was a fit replacement for these fine machines, which of course was why PCB never updated their 'breadvans' and stuck with what was best! I'm sure many of you will be pleased to see these go, and perhaps, rightly so. They're cheap, not very well built, un-fit for purpose vans at the end of the day. Yet they have played a hugely important part in keeping the privitised industry afloat in their fledgling years, and for that, they deserve their places in preservation, however few and far between they are at this point! You may need to click on the photo to appreciate it fully, but amazingly in one of those moments you get only when you're not trying, I have managed to photograph three of the latest livery repaints all on different buses, two of them being unique! Unfortunately the photo wasn't of brilliant quality, firstly due to it being taken on my phone, and secondly, of this horrific weather, but its a photo none the less. Ok, maybe I'm about to be a bit picky, but on the dull day, this dark red front does them no favors. At least the white and lighter red brightened it up slightly (note the livery in the right hand corner). Understandably, this week there's very little going on with various reductions in services and the like, although First's effort in producing special timetables for the next 3 days of service is quite interesting in its own right. But what I shall introduce here is this proposition. Do you feel you worked particularly hard this year, or didn't quite get what you wanted for Christmas? Got a spare £650'000? 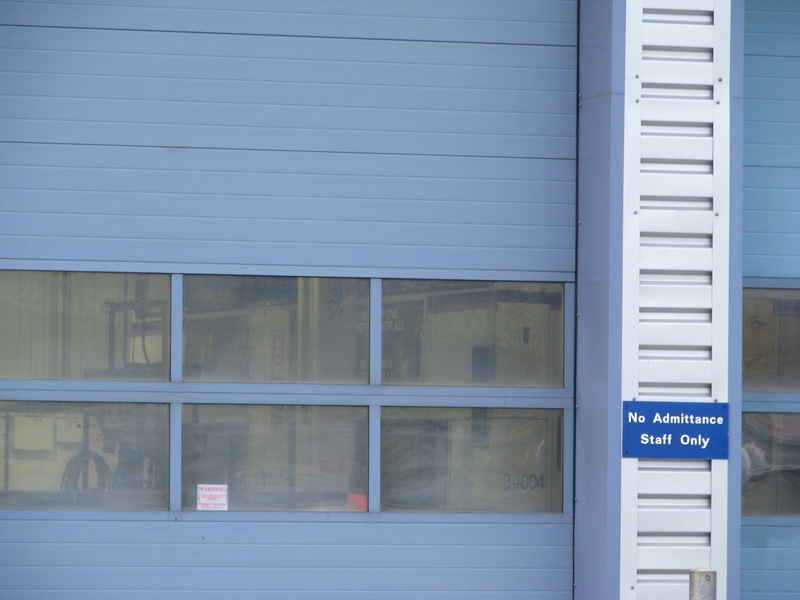 Well you could be the new owner of St Austell depot! Or, if that's a bit pricey for your liking why not have Newquay, a mear snip at just £125'000? Really strapped for cash after too many mince pies? How about Callington at just £50'000! Click the links below to view the sales in detail! Well, as Christmas draws to a close I'd just like to say Merry Christmas to all my loyal readers, contributors and fellow bloggers, and to hope that you've had an as enjoyable time as I have. Continued thanks for the year will come in the new year, so enjoy the next few days, and try not to drink your way through all of it! With thanks to Luke Farley I can bring you this very rare shot of First Devon and Cornwall Volvo B6BLE WK02 TYF having a day out across the river to Torpoint depot. 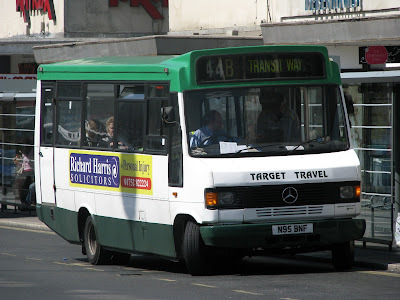 Despite the blind stating '81B Polperro' the bus was not actually used in service while in Torpoint, but was used to transport some engineering crew to Torpoint to fix Trident 32758 which was suffering with a water leak. Certainly a brave move to take a vehicle with such a long overhang, and no ferry lift across the Torpoint ferry, unless the tide was high enough meaning there was little risk of any grounding out occurring. This is nearly undoubtedly the first time a B6 will have visited Torpoint, although this is not the first time a B6 has run on an 81. 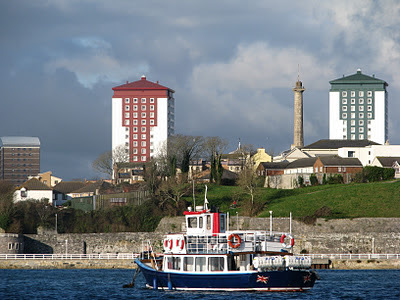 I've heard stories in the past of various failed buses having their services continued on the Plymouth side of the ferry using B6s as a stop gap before a 'ferrybus' can be put back in its place. Still, nice to see something different! Many of the local transport companies have been embracing the Christmas spirit once again this year, making the experience of using public transport that bit more special. 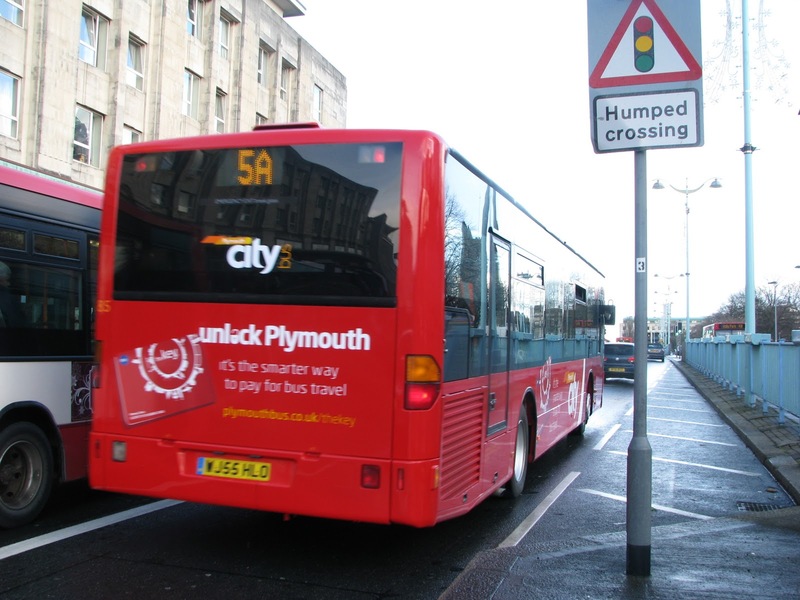 Great to see especially when it makes so much more sense than using the car, with the endless tailbacks you regularly see coming into Plymouth during the Christmas period. 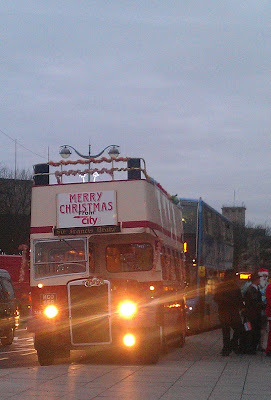 Both First and Plymouth Citybus have been having fancy dress days for their drivers, with PCB bringing MCO 658 out to play with some festively dressed passengers and music blaring out, driving up and down Royal Parade. Great to see! The Cremyll Ferry, currently in the hands of Tamar Belle has also been decorated for the season, with a mass of fairy lights, tinsel, and even a fully sized Christmas tree! 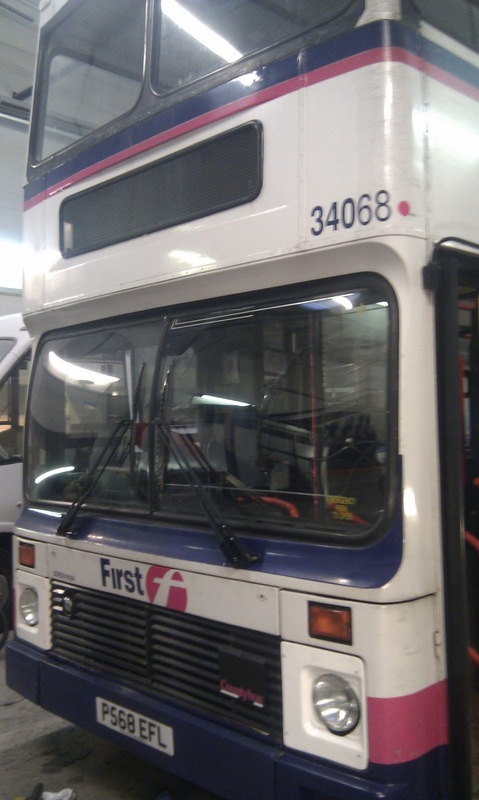 With thanks to a contributor, I can bring you these great photos of Volvo Olympian P568 EFL being prepared for service at The Ride. This is one of the large batch that were once owned by Stagecoach, but in 2002 were returned off lease, and many if not all of these proceeded to be bought by First Group, and sent to various subsidiaries across the UK, with a majority going to either Manchester or Southampton. 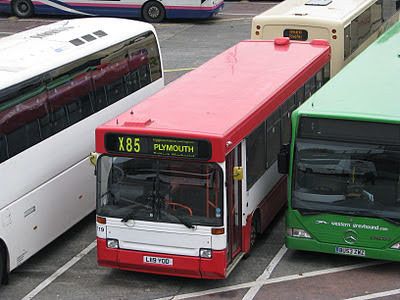 P568 is clearly an Ex-Southampton vehicle thanks to the tell tale signs of the extra black paint around the upper deck windows, which is clearly visible. 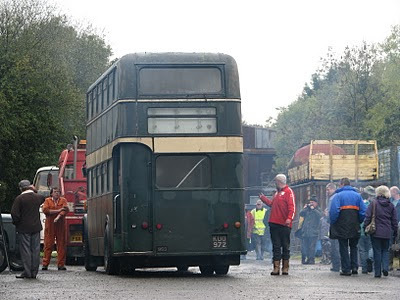 We can safely presume therefore that K804 ORL won't be making a return to service, but this addition may also end up seeing off one of the K-LAE Ex-Bristol Leyland Olympians, but of course as with everything, only time will tell! For this week's Snap on Sunday I have selected this shot from Friday lunchtime of two of Plymouth Citybus' ex-Trent Volvo Citybus B10Ms. They're seen here on Paradise Road coming down to work a special service for the early finishers at DHSB. 'Luckily' the two turned up around 20-30 minutes after everyone had already dispersed, all had either walked, or caught a service bus into town by this point. I persevered and was duly rewarded with the choice of these two beasts all to myself! 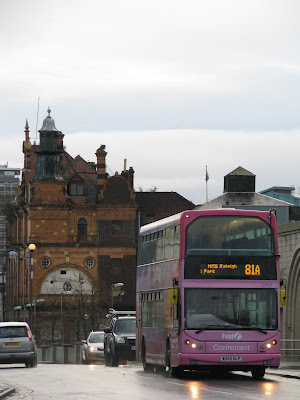 G615 has always been a personal favorite of mine, but I'd never been on F600, so on I hopped for the trip down into Royal Parade. 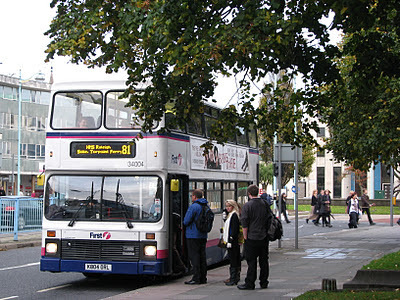 The Citycoach driver was very friendly on the trip into town, commenting that he hadn't "Driven one of these for yonks! ", but was still impressed with these machines! These Volvos really were brilliantly put together, and even at the 'grand old age' of 23, these really do fly! Unlike most buses these never seemed to lose any performance the older they've got, where as replacement have never really lived up to the reputation these have. 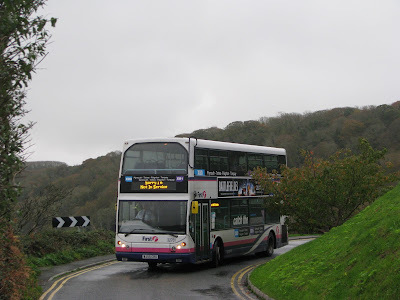 This is no doubt why the E-BTAs lasted so long in frontline service, and also why the D-GHY batch are still used today on Cornwall's open top service 300. I'd challenge anyone to come up with something as well built as these in fact! 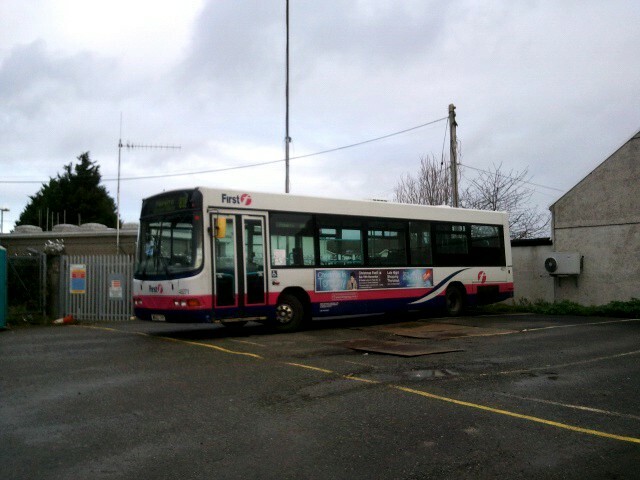 The 2nd of the K-ORL batch of Volvo Olympians has now been withdrawn from service with First Devon and Cornwall, now awaiting her rendezvous with the scrap man. I've always really liked this photo, many spotters obsess over passengers and street furniture getting in the way of their photos, and indeed at times I do to. But a really nice working shot like this can just paint the picture of what they were like so much better than a more 'unrealistic' shot ever could. K804 ORL was the 1st of the batch to arrive in Torpoint during the imminent withdrawal of the C-HJN Leyland Olympians back in 2008, joining sister K802 ORL which joined the fleet way back in 2005 during the withdrawal of the final Bristol VRs. Strange to think that the final VRs left us over 5 years ago, but that's another story! K804 has been plagued with problems for a while now as has been reported on previous occasions, so it certainly seemed to be marking the way for her to be withdrawn at the nearest opportunity. 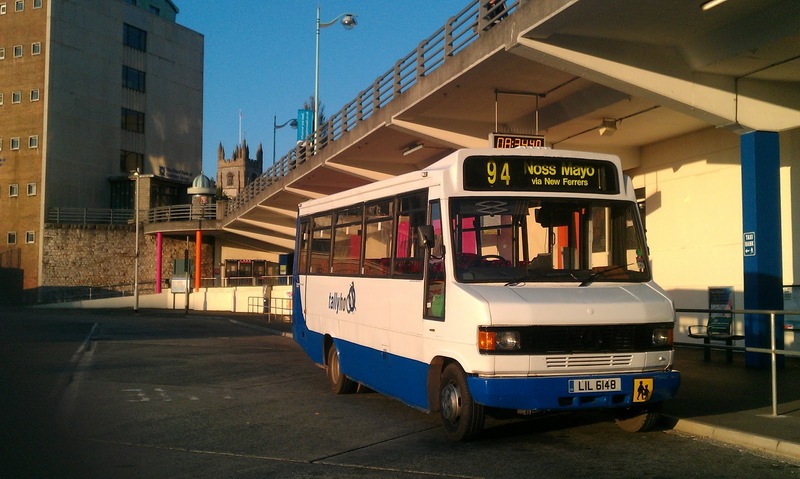 Now that Torpoint has gained an extra Trident K804 is surplus to requirement, although it has been rumored that an N reg Volvo Olympian has joined the Plymouth fleet, although I have yet to see this confirmed. 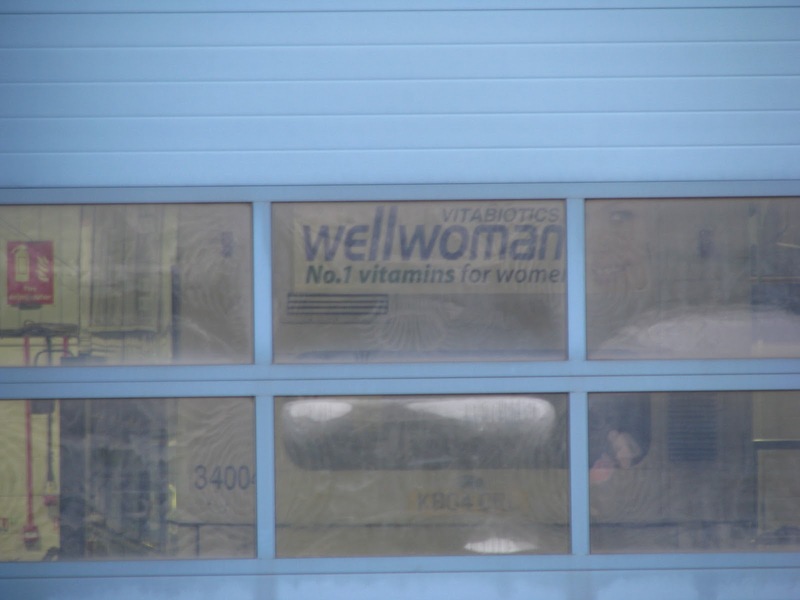 This photo shows her where she is currently resting up at Stuart's Bus and Truck, the Plymouth Volvo dealer, waiting out the days before she is carted off for scraping. I can't say I'm incredibly sorry to see this one go, but it certainly suggests the final two will be coming up for withdrawal at some point during 2012. 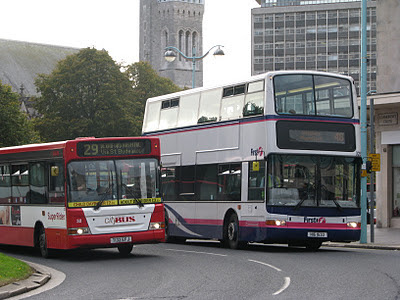 It is a sorry sight to see these old stalwarts of Plymouth finally coming to the end of their 19 year career, totally played out within the confines of Devon. Its not often these days that a batch of buses are kept local for their whole life within one of the large groups. K804 herself has given sterling service to customers on the X80 during her early life, and even to passengers of Penzance, when these enjoyed a day out on the old X1 into Cornwall. K804 has spent time on the moors on the 82, and on the Tavistock services, even penetrating Truro and local routes around Camborne during her time spent on college run 928 from Tavistock. 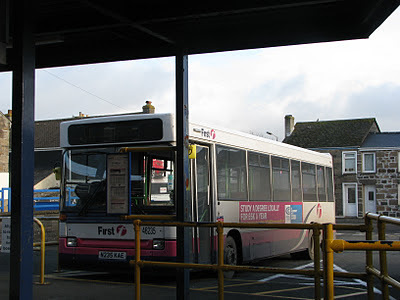 And of course, latterly joining the elite band of buses at Torpoint, which only the few selected can complete a trip on! We say farewell to K804, with 2 down, and 2 to go. As expected, this week has been preposterously hectic, but no matter, I managed a few hours in Plymouth this evening, and indeed Plymouth yet again didn't disappoint the bus enthusiast! 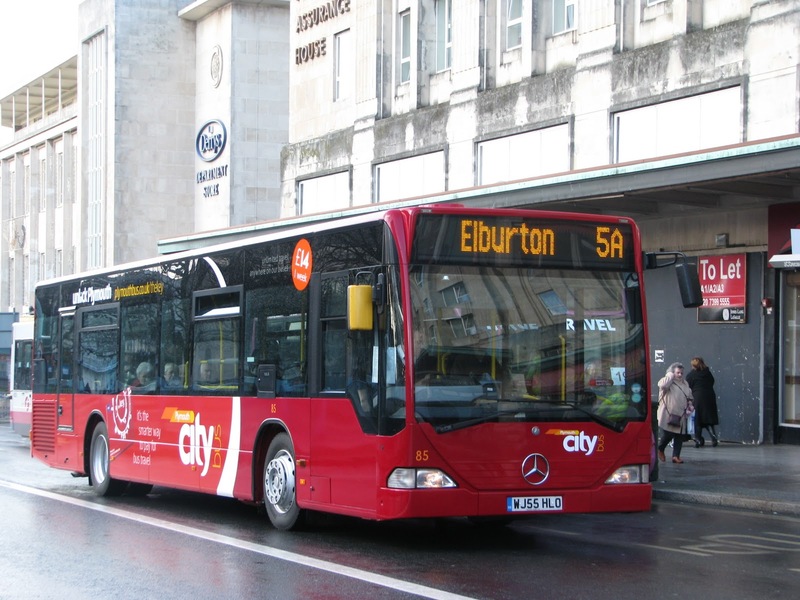 So Plymouth Citybus has now painted up the first of the Citaros into the new livery and I would suggest that it looks a lot more subtle on the Citaro in comparison to the rest of the fleet. Perhaps it was just the dull weather, but it certainly didn't seem to stand out as much as it has done on other models. 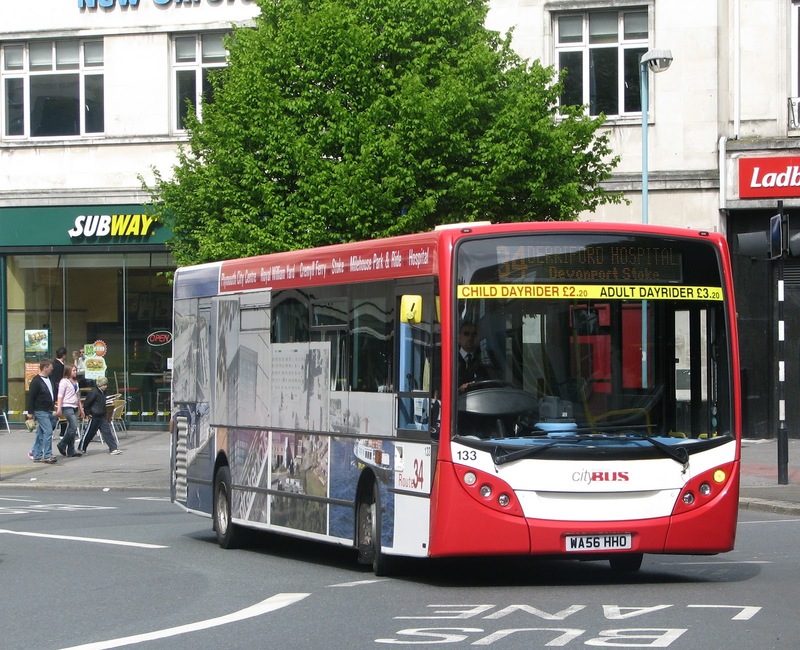 This livery also appears to suit the lines of the Citaro even worse than it did on the Dart, although it matches perfectly with the Enviro 200's. The old livery always looked particularly good on the Citaros when comparing it to other models in the fleet, with the two colour bands, but this single block colour just doesn't quite look right on the Citaro. Perhaps a bit of flaring with the red across the windows towards the rear would have done the trick, but then we again enter further debating! Enviro 200 134 is set to be the next one to be put into the livery. The only types remaining to be put into the livery now are the East Lancs Volvo B7s, and the Ex Oxford Wright bodied Darts. No trip out on Saturday this week, but I did make it to Huddersfield on Wednesday which readers of my Twitter feed will know. I hope to post about this later in the wait, but I can't promise anything as of yet, the outlook is pretty hectic! So here we see Volvo Olympian T664 VWU at the Storthes Hall residential park on which she had delivered myself and a packed load to with ease, from the centre of Huddersfield. Really good Volvo this one, certainly a nice batch of buses. You will also note that this is the one painted into Huddersfield Bus Company colours, celebrating 125 years (in 2008) of Huddersfield Buses. Very smart looking bus, even 3 years on from when she was painted. 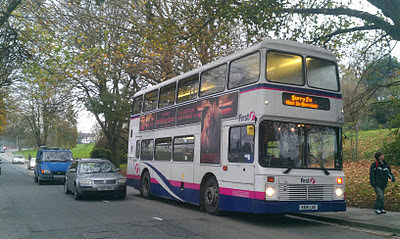 After literally months of scouring Cornwall on the odd Saturdays I have FINALLY caught up with the illusive, N235 KAE! Since N235 arrived in Cornwall in mid October, I have only ever come across her once, and by that time, I didn't have time for a trip, and if you remember, even that meeting was a fluke. Since October 22nd N235 has been hiding from me at all costs. But alas she could hide no longer on Saturday as we met once again in Camborne Bus Station, where she waited expectantly as I arrived on a Volvo B7 from Truro. If anyone had told me a few years ago I'd spend months trying to hunt down a DART, I would have thought they were mad, and consequently this whole expedition to find her has shaken me, but I have to admit it, it was well worth the effort! N235 really is a brilliant little Dart. She's obviously been very well looked after up in Bristol and Bath over the years, and she really pulled well. Even the driver commented on how good it was, even as a non-enthusiast (who thought I was completely mad!) realised and appreciated the significance of N235's presence in Cornwall. 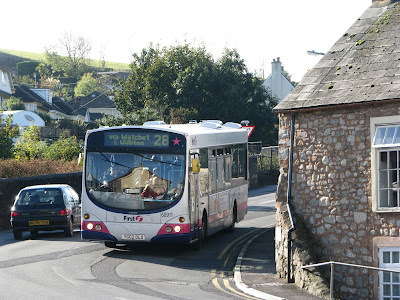 So I shall therefore include a short video of N235 on the trip I took aboard her on the 39 from Camborne to Helston (which is a very nice little route by the way), giving you the chance to experience what she's like! Long may she continue service down here, although as it stands, her future appears completely undecided. Weird how sometimes atmospheric shots can produce some of the nicest photos against all odds. I think the following three photos from this week can demonstrate this quite well. All are taken of Torpoint's Dennis Tridents which I think are actually starting to look better with age. The boldness of the pink has died down immeasurably from when they were new, and personally I much prefer this softer pink we now see 6 1/2 years on. The TTT-X batch of Leyland Atlanteans reached there 30th birthday today, after first hitting the road way back in December of 1981, these being some of the last Atlanteans ever produced. 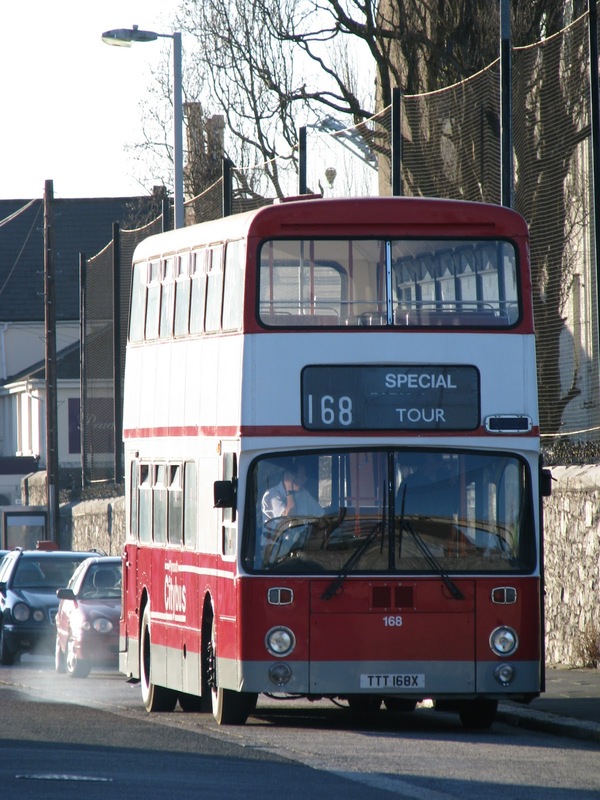 Leyland produced the Atlantean for just over 20 years, throughout which many fine vehicles were made. Thanks to the 'proper' engineering that went into them, many still survive today, including at least 3 from the TTT batch. 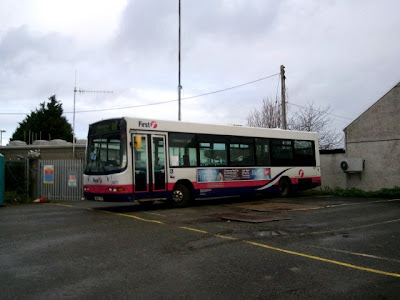 What better tribute than to be able to say one was used daily right up until very recently at Roselyn Coaches, thanks to its popularity with the drivers. Happy Birthday TTTs, many more successful years of motoring to come no doubt! The Youth Rail Enthusiasts Association 'Videofest' has been and gone for another, and so to have the final Class 142 Pacers from the region. I'm a majority of you will have already seen the photos I took on the day, but if not please do click the link below here. The video above was my entry to the Videofest this year, also giving you an overview of the day. Really fitting tribute to this Class 142 though, it really was one of those unforgettable days. Everything just worked perfectly, despite some technical hitches with 142068, my personal favorite! Huge thanks to all involved at First Great Western for making the day so successful, and enjoyable! A few interesting photos taken by Tom Pearce today of the manic scene caused by the marches through the city centre today by public sector workers. As you can see buses queued right up Western Approach where at least 13 buses can be seen. 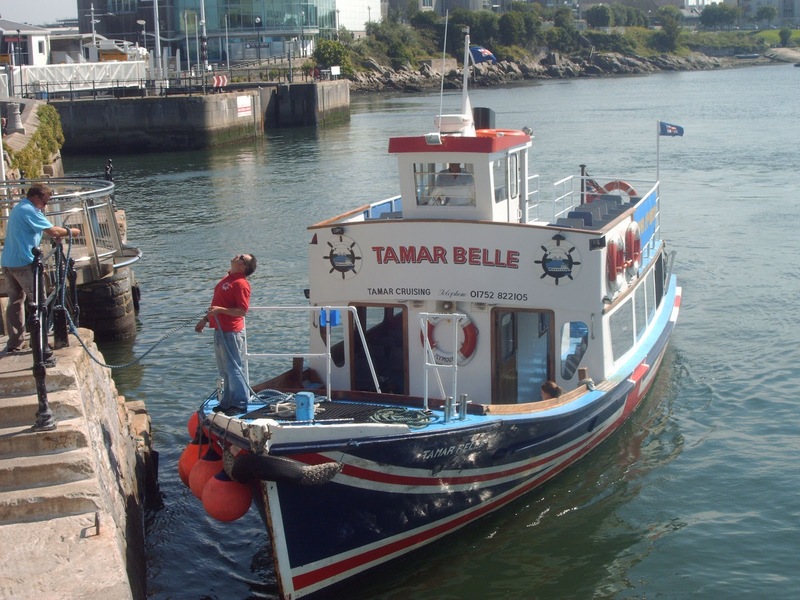 The Tamar Belle has returned to its duties operating the Cremyll Ferry for another winter season while the Northern Belle goes in for her annual refit. You will notice this year the Tamar Belle is no longer adorned with the Union Jack livery, but has now been put into the standard livery used on the Northern Belle. I hope to be able to bring you more details when the time is appropriate. 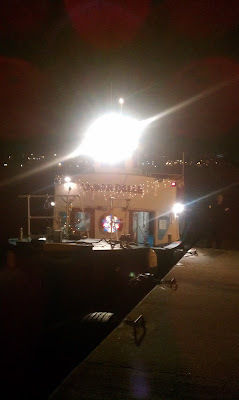 With no heaters on the Tamar Belle, passengers will have to wrap up warm for the next few weeks, me included! I may just have to huddle around the engine for some heat! Tamar Belle is pictured here in the old Union Jack livery, to refresh your memory! Well, the weather wasn't that brilliant yesterday for good quality photography, but here's a couple that were at least half decent from yesterday. Firstly here we have Stagecoach South West Alexander bodied Dennis Dart S472 BWC. These older Darts are becoming increasingly rare with the recent influx of '60' and '11' plate Enviros which make up the mainstay of the fleet today. 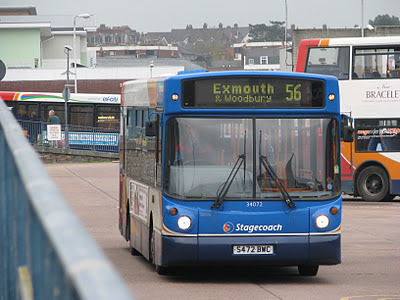 She is seen in Exeter Bus Station on the 56 to Exmouth, having arrived in from Exeter St Davids. And here we see Western Greyhound's Dennis Enviro 400 WK58 EAC awaiting its next run on the 510 in the lower bus station. 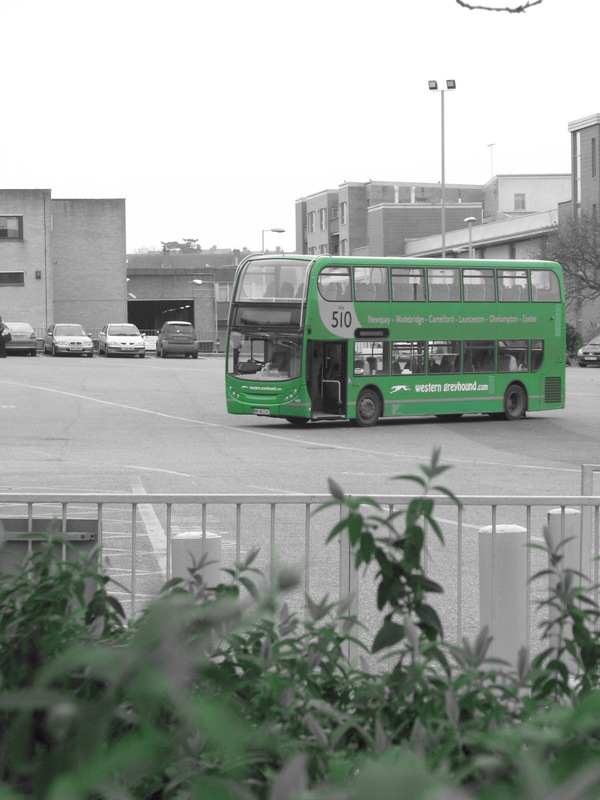 I took advantage of the limited greenery in the bus station to use the green filter on the camera to highly the bus and the plants! When things don't add up! 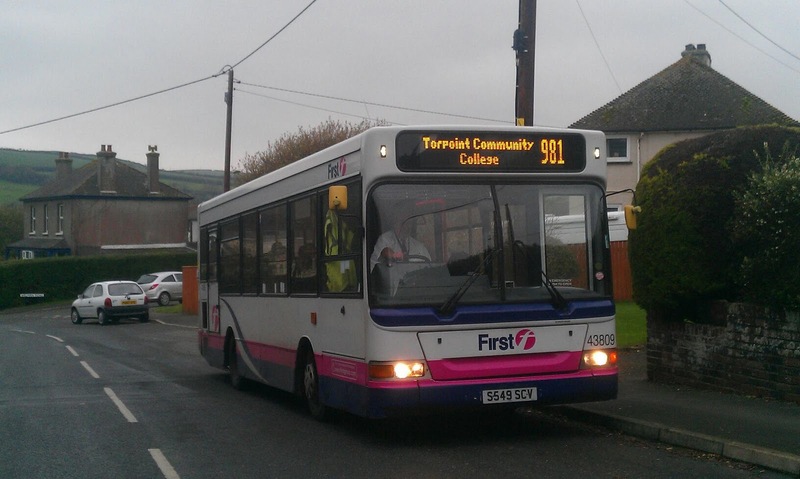 Today, First Devon and Cornwall were forced to use Dennis Dart MPD S549 SCV on the 981 Torpoint School run in place of the usual Dennis Trident! This of course naturally on its own creates problems, but it gets more silly when you consider what's been going on behind what's floating on the surface. So, a Dennis Trident that was allocated that morning lost reverse gear, so 43809 was taken out of public service to take onto the school route. Why was there no spare bus? That's because Torpoint is currently 100% low floor! 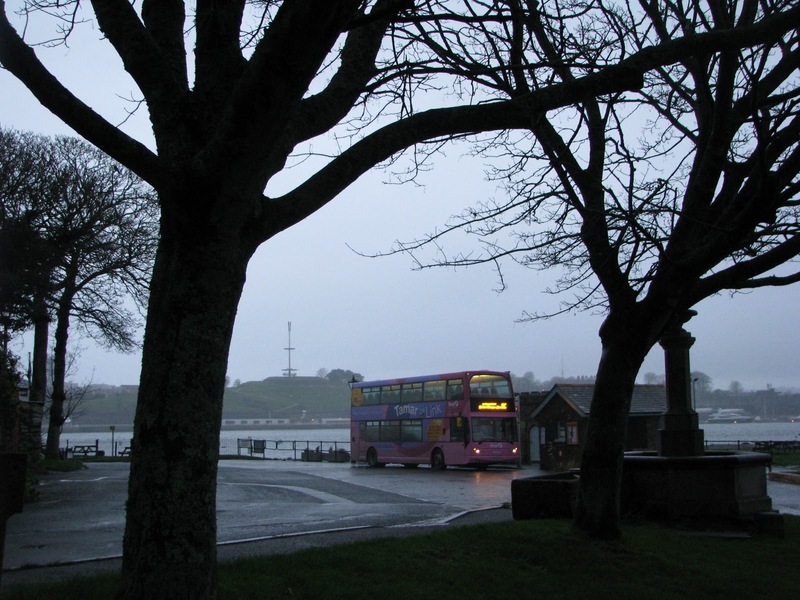 Torpoint is currently running 6 Tridents, and 3 Darts, leaving no spare buses available if something goes wrong. So where are the Volvos? K801 ORL has a major air leak being seen to at the moment. 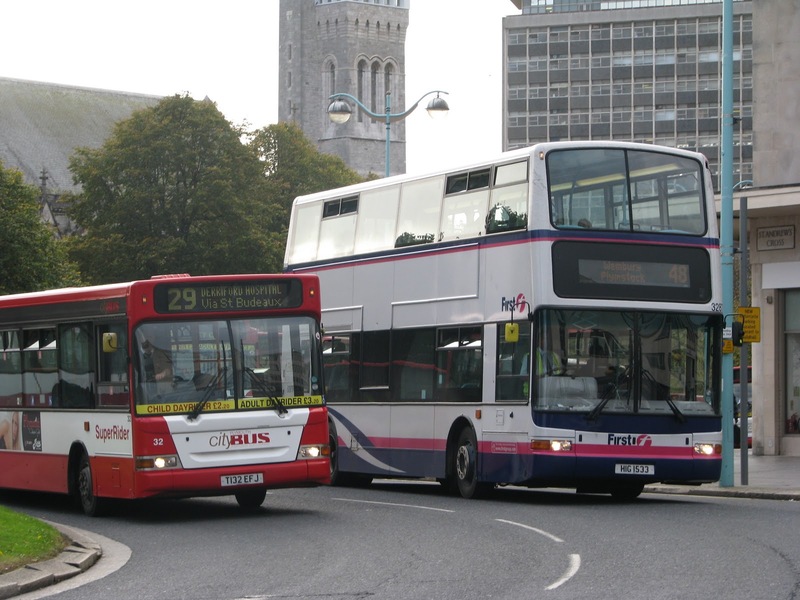 K804, is generally unreliable, so again is likely being seen to in Plymouth. But K803 I have no idea! She's disappeared for the time being. Makes you wonder why they got rid of K802 ORL when there seems still to have been work for her to do! 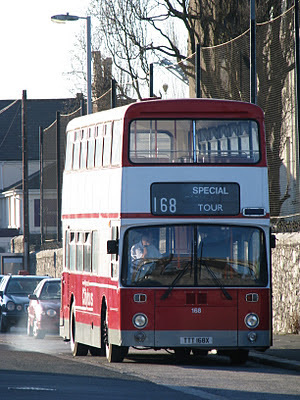 So, Torpoint had an X80 Trident, so the X80 working usually a Trident was substitued by Leyland Olympian K616 LAE! 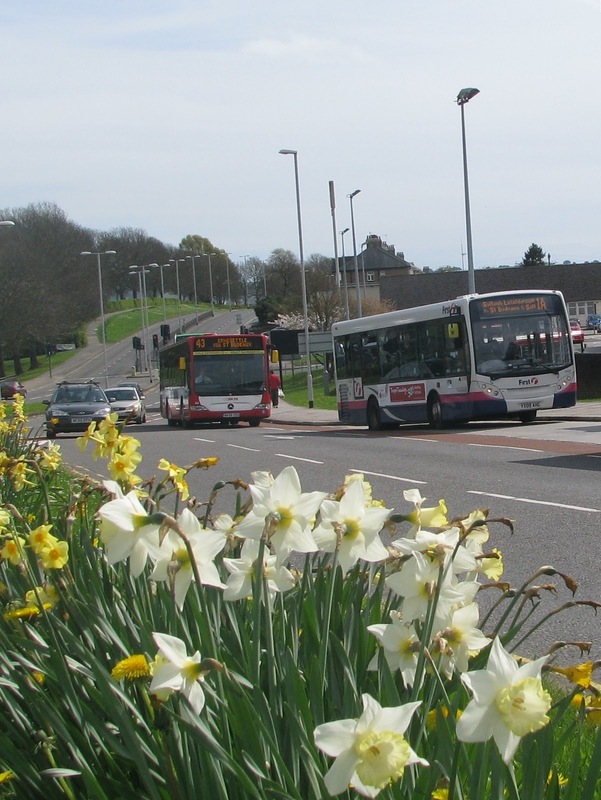 So to sum up, a Trident was at Torpoint that 'shouldn't' be, leaving X80 1 bus down meaning an Olympian had to be used, and a Trident broke down where a Trident should be so a Dart had to be used! Got that!?! A photo today of Ex-Airbus Volvo Olympian A123, now 34193, VJT 738, in the First Devon and Cornwall fleet, along with Ex-Bristol S684 AAE bringing up the rear. 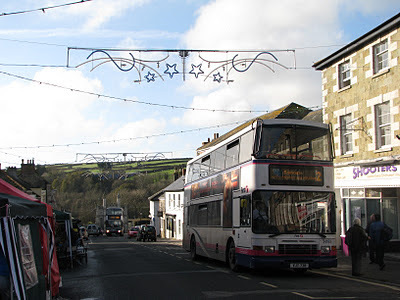 This photo was taken in Helston on a market day, with Christmas decorations already up in the town, on a crisp November afternoon. These Volvos still are stunningly good buses, I'd go as far as saying my favorite buses FDC currently run. Just a shame they no longer use these on the X80! I defy anyone to say that they'd prefer a Trident. You can't even argue that there's no disabled facilities, these have wheelchair lifts! Despite many people's opinions on the now redundant 'Route 34' livery, I really liked it! Wait, let me re-phrase that, I liked it when it was new! The livery really stood out, the pictures looked great on the sides and rear and it really did draw people's attention to the 34 as a whole. 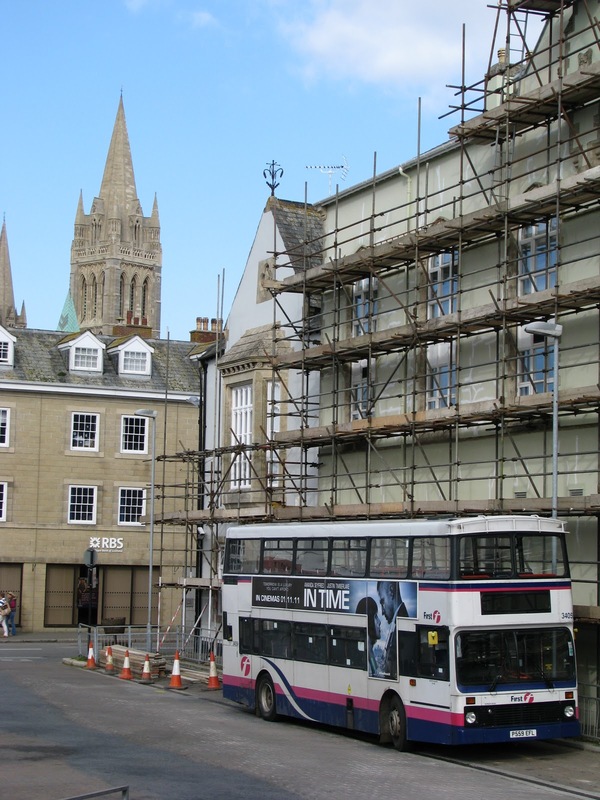 Unfortunately over time the livery faded quite rapidly, and soon was taken off to reveal the plain windows, leaving half a Northern Belle on the side, as well as various odds and ends of Plymouth buildings! 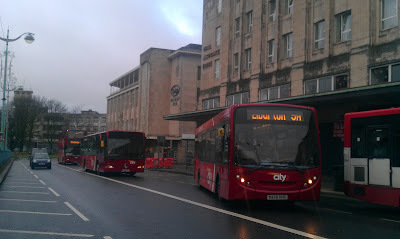 The three 34 Enviros WA56 HHN/O/P are quite rare to see on the 34 these days, and have been for some time since the official contract ended for the Enviros on the 34, bought in conjunction with the Royal William Yard developments. Its much more common to see these 3 on 5s, 40s, 41s, 42s, 43As, 44s, and so on. I must admit, I think this livery looks even better on the Enviro than it does on the Dart and B7s! The lines of the livery match perfectly with the move curvy body of the Enviro 200, and with the larger windows aiding in balancing the colour, this really does look fantastic, even on such a dull day as we have seen today in Plymouth. 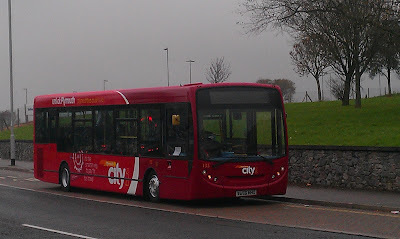 I may well have caught her on her very first trip out in the new livery, I saw her exiting the depot at around 1ish today, to take over a broken down Citaro on the 43 just outside the depot, so may well have been her first run since completed. 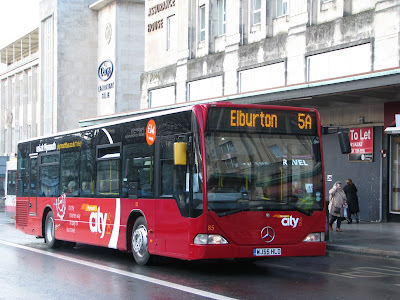 On the topic of the Citaro, that's the bus I'm really looking forward to seeing this livery applied to, but who knows how long we may have to wait to see that! This week's Snap on Sunday comes from Maker Heights with a view across to Maker Church. The bus seen here is the only Dennis Dart to be liveried in Tamar Link branding S764 RNE, 40002, rolling through the evening November sunlight. In fact, who would have thought it was November with a view like this! Simply stunning. I think this might actually have been better than the summer we had this year! If you were to go down to Torpoint depot this morning, you might just have been 'lucky' enough to find 7 Tridents, instead of the normal 5! Unfortunately, Torpoint has gained another Trident, this one being 32761. She came over for operation for the first time yesterday, this being the first time the ferry lift will have been used on 32761. She joins 32762 which has been acting as the spare but at Torpoint for nearly 2 1/2 years now, and we presume that eventually all of the X80 Tridents will make it over to Torpoint to replace the aging K-ORL Olympians. This is the first time that the incorrect route branding will have been used on Torpoint routes, 32761 carrying the new adverts for the X80/1. A 7 year track record of the correct livery isn't bad at all though! It is a shame that slowly and steadily the Olympian duties are dwindling, its quite frustrating when a Trident turns up in place of the usual Olympian on allocation! 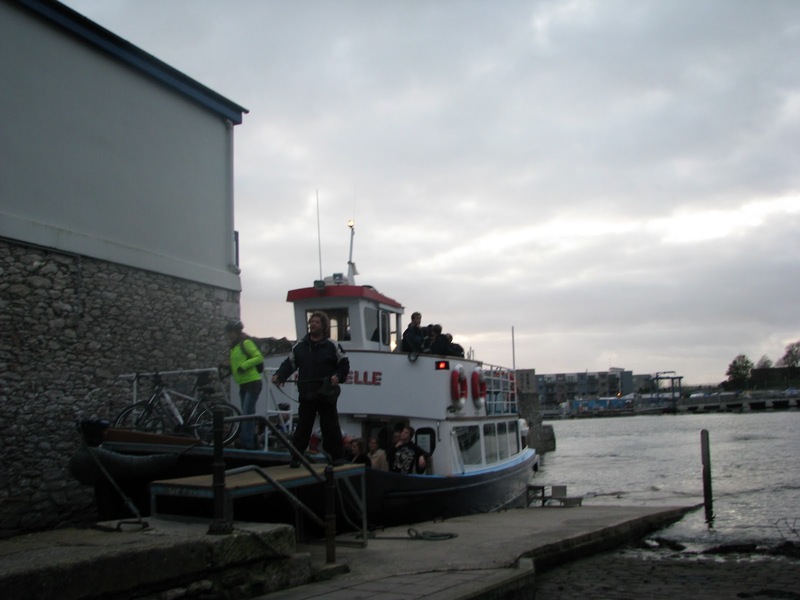 I'm not particularly looking forward to if/when these become full time members of the Torpoint fleet though! A fleet of VRs and 811s, replaced in 7ish years by Tridents and Darts! How dis-heartening! Love them or hate them, the Class 142 Pacer has become part of the scenery across branchlines in Devon once again, over the past 4 years. 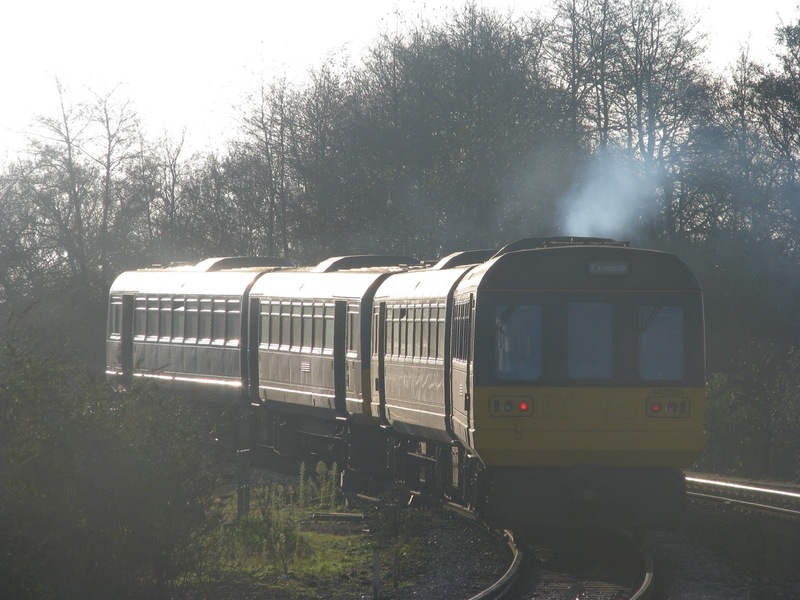 The 142s have been on loan from Northern Rail, and a short gap filler has turned into many years of successful running for the 142s in the South West. 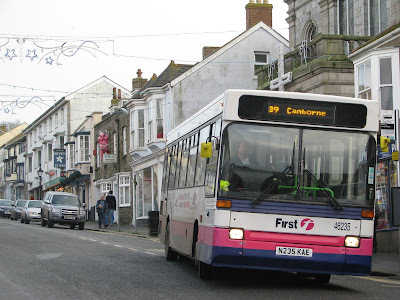 There was public outcry, when the 142s first entered service again in 2007, prompting the local news stations to take a trip to experience the 'horror' themselves. 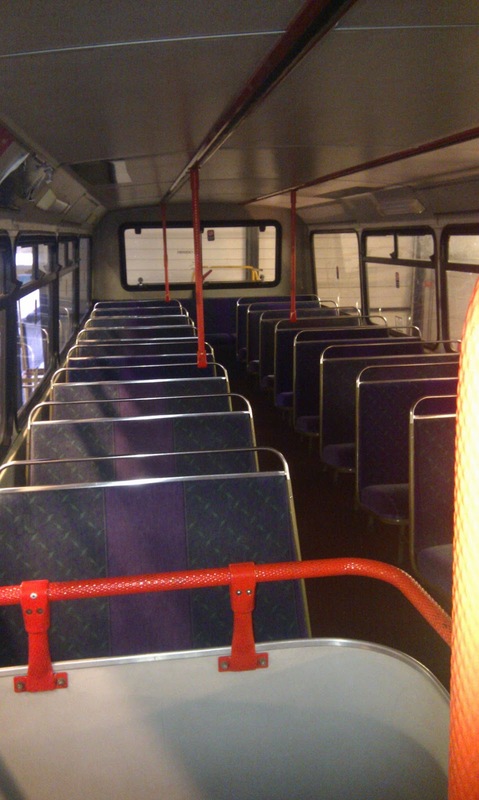 The media mocked the bus style doors, seats and general layout, as well as the boneshaking ride. But these trains have something that a lot of modern trains don't hold, and that's bucket loads of character. The 142s are quite frankly, charming little trains. There's never a dull moment when you're onboard a 142. Something that many people seem to look straight past is the extra seating capacity on these with the 3+2 seating, which is very useful during the summer seasons, and on the popular school runs. Exeter St Davids - Marsh Barton - Exeter St Davids - Newton Abbot - Heathfield - Newton Abbot - Exeter St Davids. Exeter St Davids - Crediton, Oakhampton, Meldon, Crediton, Barnstaple, Exeter St Davids then fast run to Plymouth and back to Exeter St Davids. The train is expected to comprise of 142001, along with one but possibly 2 extra units providing the extra capacity if needs be. The track that they should be running on is quite rare, so could be the one and only time to experience some of these sections on a Class 142. The tour is expected to be around £30-35, but again, this isn't yet fully confirmed. I shall post more details as and when I receive them. 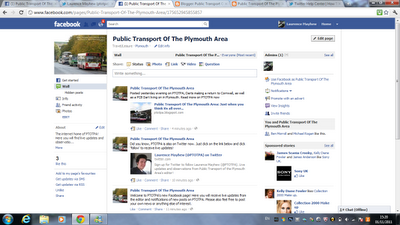 Public Transport of the Plymouth Area has entered a new era in technology. I will now be posting all updates on the blog to a page on Facebook, and PTOTPA has also gained a Twitter page. This means that you will now receive live notifications of new posts on this blog, as well as live updates and observations from myself out and about on my travels. This will enable me to post news that isn't always 'blogworthy', but will be of interest to you! These sites can also be used by yourself to post your own observations and news, as well as photos that you've taken out and about. I'll also let you know when I've uploaded new photos to the Flickr account, as well as new videos to youtube which will be of interest to you. Second Dart that has been introduced, is with Jackett Coaches. Ex Plymouth Citybus Dart L119 YOD is now within the fleet, and has been used on several weekends on their new X85 from Barnstaple on a Saturday. Nice to see that at least one is living on in Plymouth, with more finding new homes as we speak! More on that later though. Today, a view from the very pretty little harbor village of Watchet in Somerset. 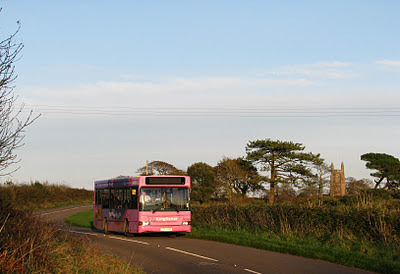 The bus seen heading towards Taunton from Minehead is Volvo B7L YG02 GLO. These B7Ls are surprisingly nice to ride on, although in half term really you do need something bigger on the service! What's that I hear you say? Am I sure this is local? Well yes, if you are mistaken, then this is Truro, but with a non-native bus! This Volvo Olympian, P559 EFL is currently on loan to FDC from its home in Southampton, the giveaway being the non-standard black parts added to the standard livery. There has been much debate in the past as to whether this black paint enhances the livery, or makes it look worse. It does depend on the bus, and even bus to bus in some cases, where we see subtle changes between liveries. So what about P559, well its certainly one of the better ones, but I'm still not totally taken in by it. It does smooth out the lines a bit, but when you compare it directly to the standard livery, its really not that good! 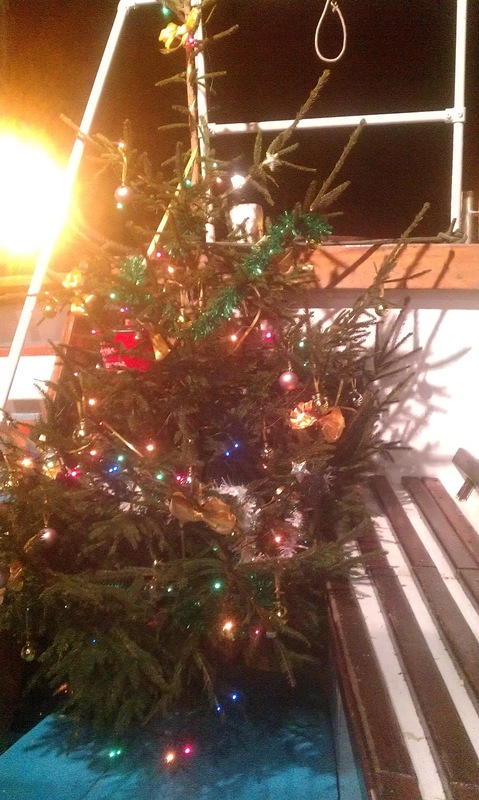 It just makes it look untidy, in particular the black around the lower deck windows. 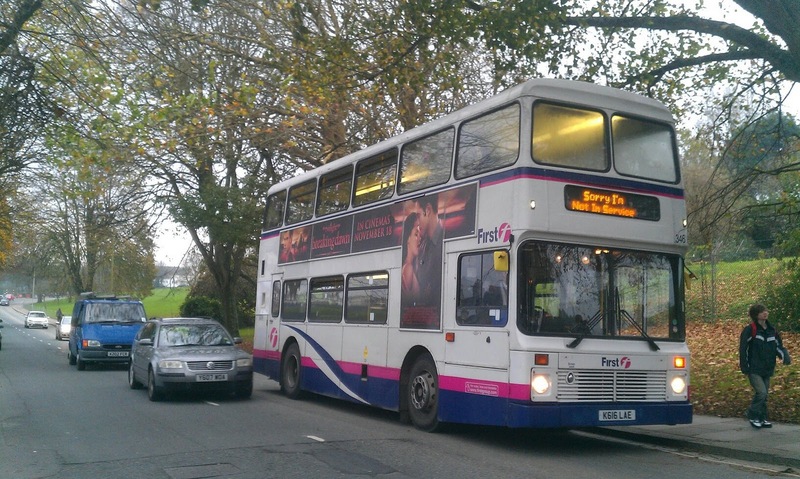 P559 is probably on loan at the moment due to the Rail Replacement currently taking place between Plymouth and Par. You certainly see some interesting workings while the B7s and Solos take on the RR duties, but more on that later! "During the duration of the road closure affecting our Oreston services 5 and 5A First Devon and Cornwall have kindly agreed to accept key cards as flash passes on their service 2 for customers boarding or alighting at bus stops in Plymstock Road, Randwick Park Road, Foresters Road, Pomphlett Close and Pomphlett Gardens ONLY. Thank you FDC." Well, what can I say, what a lovely gesture. Its certainly something I'd like to see more of, as I'm sure any passenger would. Many people ask bus companies if there is joint ticketing available between FDC and PCB, and of course, the answer is no. 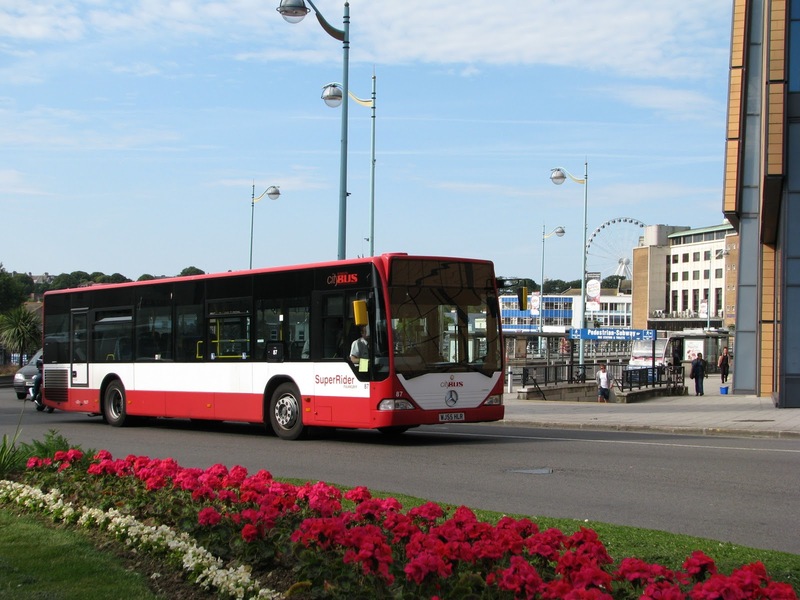 This isn't really a surprise, that's the whole point of their being two bus companies in Plymouth, to keep competition within the industry, so that the passenger should receive a higher quality of service across the board. But certainly in situations such as this, it would be great to see the companies working together to deliver passenger's the best service possible. Its at the root in situations like this, that because of the delays passengers may receive, or the missing of their all important deadlines for whatever it ends up being, that people stop using public transport, and move into private transport! 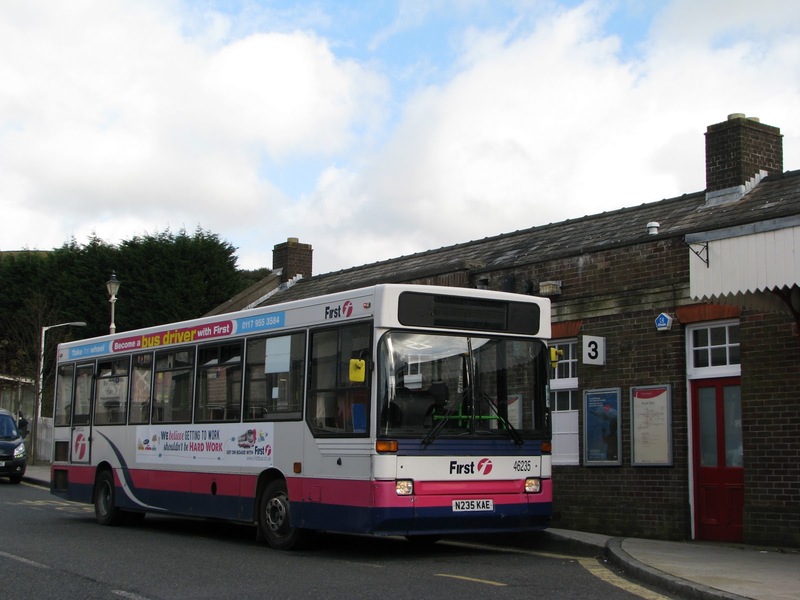 For the greater good, FDC may not be making money directly doing this, but almost undoubtedly, it will mean people will stick to using a bus service rather than using the car, full stop, or will encourage people to use FDC's services in the future. Its a win win situation for the industry as a whole, and that's the important factor in this. Many people call for companies to make it 'easier' for people to interlink with buses and trains, and that they should operate under the bracket "Public transport", rather than in competition with each other, or without 'care' for each other. Its all about making it easier for the passenger, to keep them there. A passenger lost is hard to bring back. Here we see Tally Ho's Mercedes 709 laying over before working to Noss Mayo on the 94, usually in the hands of the slimline Optare Solo. Tally Ho took the route over from Target Travel a few months ago, who were operating it on behalf of FDC. This 709 really did look stunning in the new livery of which pretty much the whole fleet is wearing now. Certainly a lot better than the red livery, which never really did the 709s any favors, but this livery has made them look much more modern. Believe it or not, this photo was actually taken using my phone! Even when you click on the photo to enlarge is, it loses very little clarity, I've been very impressed with it so far! Heading for Devon in the glorious low October sun we enjoyed last Sunday we see Tamar II (?) crossing the river from Cornwall. Beautiful! 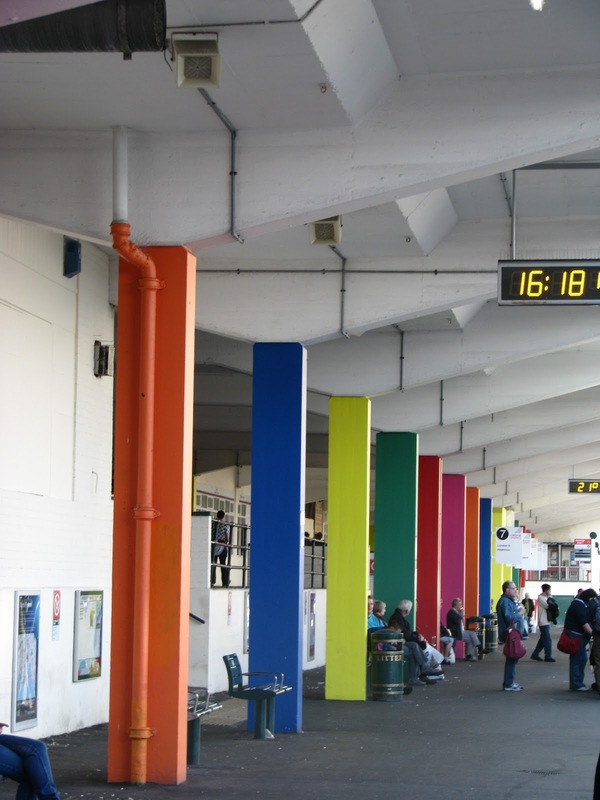 Bretonside has been getting a splash of paint over the past couple of weeks in a range of really bright and bold colours. I must admit, this small amount of effort has absolutely transformed the lower station, it genuinely looks inviting! There doesn't seem to be any real pattern to the colour scheme, and that's possibly why its worked so effectively. Then again, it may also develop your thoughts into, is this paint just a variety of leftovers that PCC found in their stores? Even if this is the case, its really brightened the dull appearance of the pillars the are so dominating along the lower station. 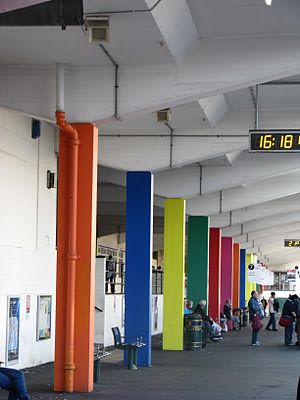 I'm really hoping we'll see more of this if and when they refurbish the rest of the concourse. Bretonside hopefully will now become somewhere they is pleasant to waste away time waiting for a bus or coach to whisk you away. Then again, I doubt some paint will cure the 'scene' that we still find in Bretonside, but who knows! The radio idea never really worked in clearing these people, although it does still make it more enjoyable for the people who are down there. Those safety announcements are dreadfully annoying though, especially when you've had to hear it in 4 languages. But still, I will say a well done Plymouth City Council on this one! After 3 years scored off the rally calender the Winkleigh Rally at the West of England Transport Collection will be making a return tomorrow. If you've never been before, Winkleigh is a rally that is just completely different to any other you'll visit. The photo I've posted at the top sums it up quite well really! 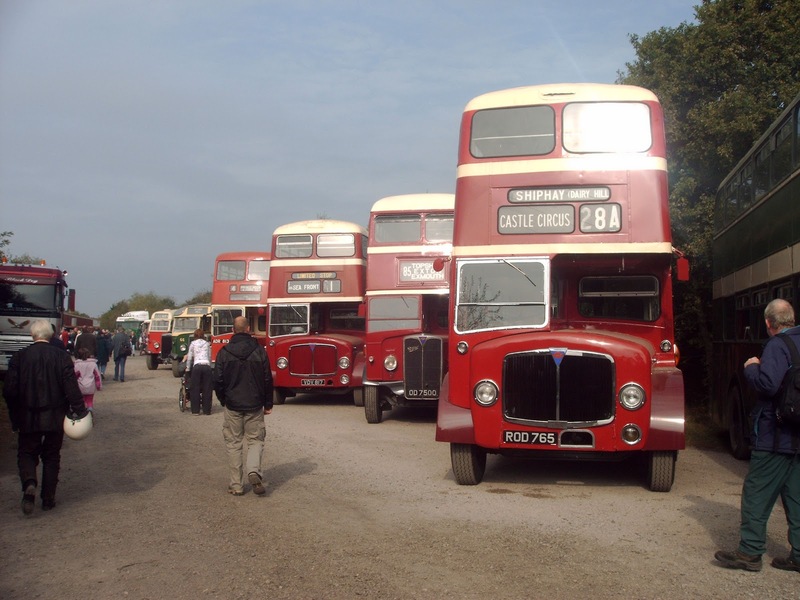 A rally with copious amounts of half cabs, a huge selection of buses both rotting, and in preservation waiting for their chance to be restored. 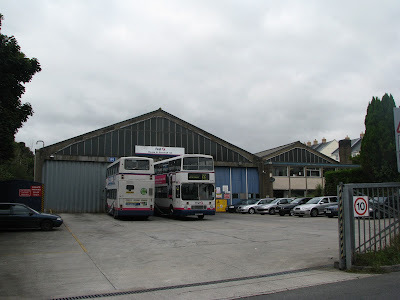 Some people describe it as a scrapyard, I wouldn't go that far, but Winkleigh is indeed a place where buses are acquired, and 'dumped' before their fate is decided. Its fascinating looking through what's on offer, looking at what's reached the end of their lives, and what we may see back out on the road in the future. The dis-used (well no, not dis-used, they're filled with buses now!) hangers that many buses are kept in also add to this atmosphere. Really worth coming along for something different. 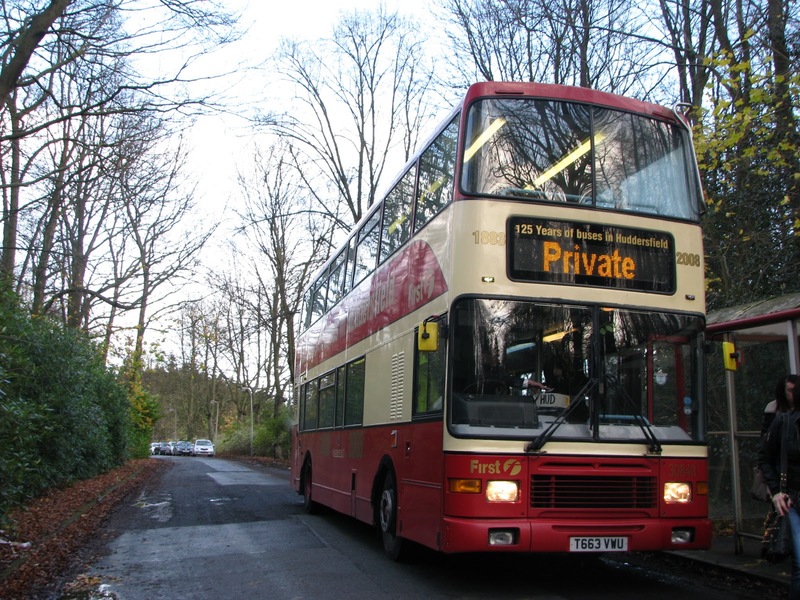 There are due to be many more trips operating this year, departing every 5 minutes from the rally site! All kicks off at 10 if you're interested.